I installed 12.10 to Asus Zenbook Prime UX31A. Now I face a resolution problem. The default resolution is 1920x1080. But everything is too small with this resolution. Icons, Unity, file system, browsers etc. For example in Chrome only when I set the zoom to 150% sites view normal. When I use the 16:9 resolution 1360x768 the size problem is fixed, but in this mode the display colours and view are blurry and thick, so it harms the eyes. 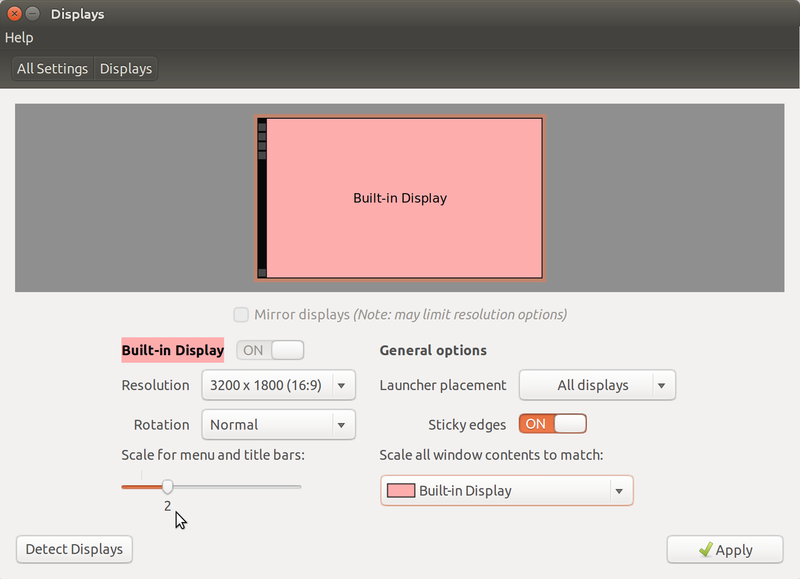 And as my display supports 1920x1080, I think that I better keep this native resolution and fix size problem instead. How can I solve this and get the desktop displayed in an acceptable size? EDIT: Ubuntu 14.04 sort of supports high resolution screens and allows you to scale the panel and launcher with a simple slider under System Settings -> Displays. It's still a bit buggy: it doesn't work for some apps like Spotify doesn't scale and Thunderbird don't scale icons and the content of the emails. So while Ubuntu took a giant leap forward, the below solution is still the only fully functioning way of scaling everything on Ubuntu. You can scale everything with xrandr but the result is not as pretty as it could be if there was true high resolution support. So, in my case my laptop display is called LVDS. The Launcher and Panel might disappear for a moment, but just hover your cursor over them and they should reappear. You might also have to resize any open windows so that they fit the smaller resolution. I wish there was true high resolution support that was this easy to configure. Sadly even GNOME 3.10 seems to only support changing the font size, even though GNOME handles that a lot better than Unity. Open dconf-editor and goto /org/gnome/desktop/interface/text-scaling-factor and adjust the scaling. Calculate the scaling by 1920/screen width in inches/96, assuming that you display is set to 96dpi now (check with xdpyinfo | grep dots). You can play a bit with he scaling factor to get to a size you like. I think this is a problem that hasn't been addressed, yet. The retina display on some Apple computers has a resolution of 2880 x 1800. (Take a look at how ubuntu looks on one of these.) That's only any good if the icons etc. are actually displayed at a higher resolution as well. As more and more high-resolution displays hit the market, I figure that ubuntu will have a solution for this fairly soon, though. I had the same problem with my Vaio SVZ13114GXX. Give Unity Tweak Tool a try, I tested many different combinations from Appearance and ended up with changing font size from 11 to 13, and setting hinting to full. Test on your own system for best results. Not the answer you're looking for? Browse other questions tagged unity display resolution ultrabook or ask your own question. How do I change the font DPI settings? How to change the screen DPI in 11.10? How can I make PDFs appear life-size when displayed at 100%?